Altra’s Lone Peak 4 Trail Runners are hiking and running shoes with an extra large toe box that lets your feet spread out and relax for more comfort on long hikes or runs. Made with breathable mesh, they drain well, dry quickly, and provide excellent underfoot protection on rocky or root-filled trails. If you’re on the fence about whether to switch to trail runners for hiking and backpacking, these trail running shoes might make a believer out of you. It’s been a few years since I reviewed a pair of Altra Trail Runners and I wanted to see how they’ve evolved, since they’ve far and away become the most popular hiking shoes used by backpackers today (See 10 Best Hiking Boots and Trail Shoes.) The Lone Peak 4 has also undergone some major design changes from the Lone Peak 3.5, so it’s been an opportune time to reexamine them. 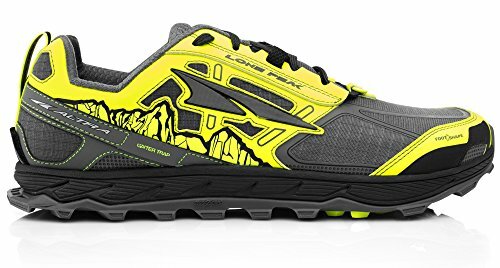 While I still prefer the La Sportiva Ultra Raptor trail runners I’ve been wearing for the past 4 years, I could easily see myself switching to these Lone Peaks, if La Sportiva changes the Raptor design or stops making them. Knowing shoe companies, that’s bound to happen sooner or later. The most distinctive thing about the Lone Peak 4 and Altra Trail Runners, in general, is the large toe box at the front of the shoe that lets you spread out your toes and wiggle them around. When you walk with these trail runners, it really does feel like you’re walking with bare feet down a wet sand beach. That barefoot feeling occurs because the Altra Lone Peak 4.0 is what is called a zero-drop shoe. In other words, there’s no height difference between the heel and toe, resulting in a flatter footbed, compared to more sloped one in shoes with a larger heel-to-toe drop. The benefit of a zero drop shoe is a more stable landing platform, better balance, and reduced chance of ankle rolls. The toe box and exterior of the Lone Peaks is covered with a fine, breathable mesh that drains well when it gets wet, but is fine enough to block sand and grit from entering the shoe. There’s a hard toe kick in front of the toe box for protection with an additional strip of TPU protection surrounding the toes. The outer mesh extends down the sides and around the heel, interspersed with additional lateral protection and support. The interior is lined with a wicking fabric to move sweat away from socks and feet. The tongue is gusseted forming a sock-like fit. This helps prevent debris from entering the shoes and keeps the padded toe positioned comfortably over the top of the foot. The laces are routed through wide eyelets to help reduce pressure on the top of the foot and help prevent painful irritation from tight lacing. The Lone Peaks have a surprising amount of EVA mid-sole cushioning for a zero drop shoe, which is particularly noticeable on hard packed trails and those inevitable road walks. It’ll put a little spring in your step and reduce the foot fatigue that results when walking over flat terrain. There’s also a rock plate under the forefoot for additional protection, although more of a necessity for high impact trail running. Deep, multi-directional lugs provide excellent control on a variety of surfaces from mud, ice, snows, dirt and gravel. The soles also do a better job on wet rock than the Lone Peak 2.5 trail runners, I tested several years ago, although the traction is still not as good as the sticky rubber on La Sportiva Ultra Raptors, which are phenomenal in that respect. The Lone Peak 4.0 comes with a rear gaiter trap to hold compatible gaiters, like those from Dirty Girl, in place. There’s also a front gaiter hook over the toe box which is quite useful for spring hiking in snowy conditions. The insoles (left) included with the Lone Peak 4s are foam and provide little support. I replaced them with Superfeet Carbon insoles (right) which are designed for low volume shoes and are much longer lasting. The only part of the Lone Peak 4.0’s that is disappointing are the insoles, which are crappy foam inserts that provide very little anti-pronation or arch support. With the exception of Oboz hiking boots and trail shoes, most trail runners, trail shoes, and hiking boots come with terrible insoles. As someone prone to plantar fascitiis, I always replace the factory insoles of my trail runners and boots with Superfeet Carbon insoles, which are designed for low volume shoes. It’s a hidden cost, but the alternative is debilitating. These third-party insoles fit into the Lone Peak 4.0s without any issues. 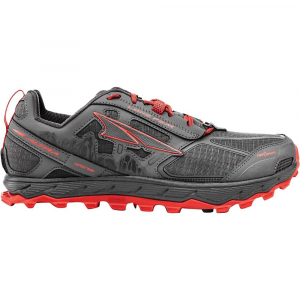 Altra’s Lone Peak 4.0 trail running shoes are a great lightweight shoe option for hiking and backpacking, with a roomy front toe box, good cushioning, and good foot protection. If you’re prone to blisters or black toenails with your current hiking footwear, I’d definitely recommend giving these trail runners a shot. Wearing a lightweight and quick drying trail runner can quickly change your attitude about appropriate hiking footwear. Your toes will thank you too. To me, the fit of the Altra 4.0s seemed much more narrow/confining in the mid-foot area than the 3.5s; so much so that I considered returning them. This was disappointing, as I struggle to find shoes that fit and Altras had become my go-to hiking shoe. I found that switching out the stock insoles with the low-volume Superfeet Carbon insoles that you recommended in the past improved the fit significantly. Great review. I used Lone Peak 3.0 and 3.5s on the first half of my AT thru hike last year and loved the fit and comfort of that wide toe box, but chose to move away from them because the tread was just too poor. In mud or snow, those round cleats just filled right up immediately and was constantly sliding around even when new let alone after they started to wear down. By the look of those treads, it seems like they fixed that issue up. Might have to get another pair when my current trail shoes (Saucony Peregrine 8) wear out. I hiked 600 miles of the AT in the Lone Peak 3.5 in 2018. The comfort only lasted for about 100 miles as I felt the cushioning wasn’t enough – even with Superfeet insoles. I am currently wearing the Altra Olympus 3.0’s and I find them much more comfortable for long distance hiking. Broad toe box, lots of cushioning, wide and grippy vibram sole. And the first Altra shoe I’ve worn wear the toe protector didn’t start peeling off within a few days of purchase! Yes, I like the Olympus has that extra cushioning – keeps a spring in my step. Sorry to hear that the Lone Peak couldn’t cut the mileage. Two strikes and their out. Still wearing the 4.0 Mesh Mids around the house to be sure there’s nothing wrong that will manifest sooner than later. There’s a little knob of material where the top of the tongue meets the rest of the shoe. Will take some miles to see if that’s a problem. The sole is stiffer than i was expecting, which, for me, is a good thing. One thing i’ve noticed is that my Smart Feet inserts don’t fill out the width of the shoe in the forefoot area. There’s a good .25-inch or so gap. The edges of my feet feel this; not sure if it’s going to be a problem after some number of miles. Anyone know if there are similar, structured insoles that come in wider sizes.? I’ve looked around a bit and haven’t found anything. Given that some manufacturers have been offering wider hiking/running shoes for a while now, i’m a little surprised that the insole makers haven’t responded, at least from what i can see. Hi Nick, Yes, I noticed the same issue on the insoles leaving a gap in the toebox. What I’ve done with superfeet is to get one size larger and then cut the toe-end down to the same size as the included altra insole. That’s worked pretty good. Thanks for the suggestion! I’ll take a look at a larger size iSmart Feet insole. With regards to the knob where the tongue meets the rest of the shoe, if it is the same thing I experienced, I had to smooth it down by sticking my finger in my shoe after I put them on. Initially this took care of the issue and after awhile it resolved on its own. I have tried Oboz inserts and Dr Scholls. Neither fits perfect but the Dr Scholls is more comfortable than the Oboz. Oboz makes an after market insert you can buy at REI. Mine was from an old pair of Oboz so I don’t know if they fit the same. I preferred the 3.5 as the 4.0 seems narrow at the arch of my foot. A previous pair of Merrills had a small spot where the fabric overlapped where the tongue was sewn to the shoe, creating an oh-so-slight bump. It never bothered me on shorter, day hikes, but after a couple of days into a five-day hike, my skin was rubbed raw there. And the shoes were well broken in. Seems like one never knows how shoes are going to work out. I’ll take a look at Oboz and Dr. Scholls inserts. Thanks for the suggestions! Just took a quick glance at the good doctor’s website; lots of different styles of insoles there. Will try to sort it out. Also, check out the Currex insoles. They are great and they dill out the toebox better than Sole or Superfeet. Thanks for the suggestion! Haden’t heard of these. I’ve had great luck with Altra Lone Peaks. They are very comfortable, light and dry very fast. I currently hike in the Altra Timp model (https://www.altrarunning.com/shop/trail/timp-trail-alm1757f#hero=0). It has a more cushioned sole (zero drop), substantial tread and the same wide toe box as other models. Well worth trying out. I find I prefer it to the Lone Peak 3.0 models I used before. The 4.0’s look interesting. Thanks for the great review Phil! I used the Altra superior 3.5 on the Long Trail mud-slicked rocks, and found them to be stickily sticky! A bonus for my narrow feet was being able to easily tie them well enough, even with their wide toe box. FYI, I have used Scarpa, Sportiva, Lowa, and 5.10, and find – so far – Altra to be the closest shoe to “barefoot” comfort for these extremely narrow feet. Fine for just walking. I’m not a runner, so fine for low impact. Thanks for replying… I am looking at the Tread on the back of the heel and I have a similar Trend Pattern in a pair of Tall Boots and well,,, ouch…. I really like that big box toe and that is the first thing I look for when buying any footwear….”The Toes Knows” has been my motto for 30 years…. Why do so many outdoor shoes now look like “clown shoes” with bright colors? I won’t buy shows like that even if they levitate me. I have just purchased a pair. Nice and comfortable, but slightly surprised by the softness or rather flexibility of the uppers which have more give than previous trail shoes I have used. Slightly disconcerting but I expect I will get used to it. May require tighter lacing than I am used to.